Amy Crum's lyric collages are lithe, rhythmic, elegant, yet they possess an antic sense of humor. They do what all good Art must do: They keep beginning. These works evoke music, plants, architectural detail, and the written word; they seem to be a story that rewards the viewer with each repeated viewing; and I , for one am happy to get lost in these small, wondrous mysteries. Within the folds of a flower petal or the curvature of a letter exists a strong connectivity to the early machine age and how these shapes were used to satisfy a budding lust for production. Bold, stark and presented with simple, crisp lines that relate to their industrial forbearers, Amy Crum turns this idea on its head by presenting imagery that forms bouquets of women, florals, shapes and letters. Joining together disparate pieces is a welcome addition that implies ones’ attachment to the mechanical with our innate desire for the organic. In full, they present a commentary on the past that also cultivates a quickly adaptable modern sensibility. When ideas and images appear all at once, are we wrestling with complex human emotions that pull our thinking in different directions? The likely response is that it’s in our nature to accept concepts as they appear and slowly unravel them, deciphering their meaning as they need to be met. The images here are actually straight lines that have been broken up and Crum feeds our natural curiosity to rectify their sequence into some form of linear narrative. When you stand before a silhouette of a woman, it is one point of departure. Bold, distinctive shapes are another. Recalling the American painter Elizabeth Murray, whose compositions pushed the boundaries of spatial lines, are in a similar harmony with what Crum has done here. Throughout each piece, fluid, tube-like shapes act as conduits, leading us into one portal of existence then propelling us towards the next. This work is a pure ethos of what Art Deco means: “an assertively modern style (that) responded to the demands of the machine and of new material” while displaying a style which infers symmetry with asymmetry and the rectilinear with the curvilinear. Such imagery is a visual dramatization of philosophies to which Crum subscribes. She believes in beauty, order and ones’ innate need to see and feel on multiple levels. This is achieved as we experience her selection of objects for both their individual beauty as well as its collective power. Blair Schulman is an art writer/critic and regular contributor to Huffington Post. 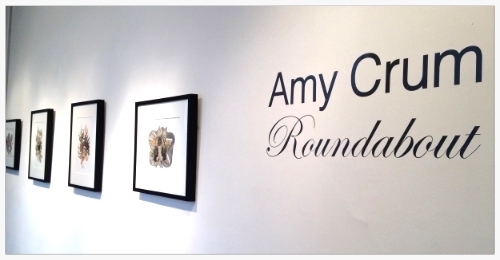 A few days ago, I visited the studio of artist Amy Crum, in her home near the Chicago River. We sat for over an hour next to a window with a view of treetops and plants, looking at her recent work spread out on the floor around us. She's recently returned to making art after a long break, and what she's been doing are collages with some ink and paint additions, all on letter-sized paper. The collage originates in vintage newspapers and magazines from Europe, which gives the overall tone of her pieces a subdued, cool, look. You can spot all kinds of individual objects and stylistic pattern in the source material (flowers, letters, clothes) but each piece is clearly about the abstract pattern of Amy's arrangement of these bits and pieces. They all occupy an elongated space in the middle of the paper, either vertically or horizontally, and the forms spiral out and back in on themselves repeatedly, no matter which side you see them from. It reminded me of looking at the patterns a skilled skater leaves in an ice rink after a performance. Another impressive thing was that in less than six months, she's produced what art world people call a 'body of work' -- a group of pieces with a coherent set of themes and a commonality of execution. She's also produced them all in small spaces, at home, on table tops, proving that you can make good art anywhere.